It must be something to do with getting older – for virtually the first time in my life I'm actually spending a week in the same place. A holiday for me usually means darting from one place to another, spending no more than three nights in any one place. This time we’re in rural India having returned for the second time to a small heritage hotel overlooking the Narmada River called Ahilya Fort. Its owner, Prince Richard Holkar, is a direct descendant of Queen Ahilya Bai Holkar and divides his time between India, Paris and California. The hotel is perched on top of the fort on a hilltop about 200 ft above the river. There's endless activity on the ghats below, it starts at dawn and goes on well into the night with all sorts of excitement, both men and women come to bathe, say their prayers and make offerings to their mother river. 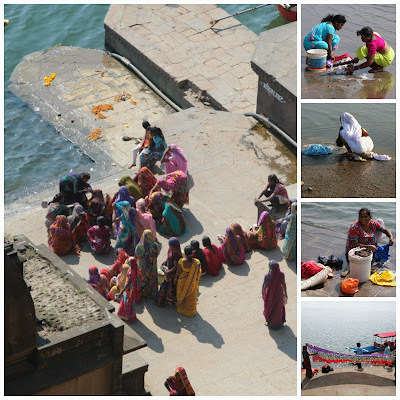 All day long, women in brightly coloured saris wash their clothes on the water’s edge, they bash them with a timber bat and then lather them up with lots of suds all of which goes into the river. Despite all that, it is virtually un-polluted. They swim in their saris and then hold them up to dry in the warm breeze. Pilgrims bathe in the river to wash their sins away and children splash and dive to their hearts content. Holy men with long beards and saffron robes wander up and down paying homage at the many shrines on the ghats and at the temple. There are lots of little gaily painted boats taking people backwards and forwards across the river to villages on the other side where they grow cotton and make handmade bricks from clay and cow dung, much of the cooking is still done on open fires over wood and dried cow pats. very one quite different, and many have little verandas overlooking the Narmada River, the temple or the garden. There's a constant stream of interesting people coming and going so each meal is an adventure, particularly as there is no dining room as such, so the location of each meal is a surprise, and could be on the terrace, by the pool, in the inner courtyard, or in a little open thatched house in the organic vegetable gardens. There’s a rich bird life, a paradise for twitchers. There's a fantastic variety of birds, apparently there are over 3,000 species in India as opposed to around 250 in the geographical area of the British Isles. Little chipmunks chirp and dart along narrow ledges. Goats and cows amble idly around as they do along the main street of Maheshwar and through the market which I always check out when I am on holidays. The town itself is throbbing with lots of shops selling the richly coloured silk Maheshwari saris, hand-woven strand by strand in the local workshops. In the early morning while it is still cool we sometimes take a boat and float down the river to watch the sun rise. And then in evening when the temperature drops again, people go out in gaily painted boats to watch the sun set behind the Maheshwar temple. As soon as darkness falls, hundreds of deyas are floated down the river, little leaf or paper bowls with a candle flickering inside, drifting downstream carrying a wish or the memory of a loved one. It is a breathtakingly beautiful and memorable place.